TORONTO, Nov. 01 /CSRwire/ - FlipGive	is	collaborating with	Scotiabank	to	power	the	new	Scotiabank	Hockey	Club	Fundraising	Tool	for	the	2017/18	season. FlipGive	is a	cash	back	site	for	youth	sports	teams	that	facilitates	fundraising	through	online	shopping. It focuses	on	helping	parents	manage	the	cost	of	sports	by	providing a	fast,	easy,	and	free	fundraising	solution	that	is	powered	by	online	shopping. 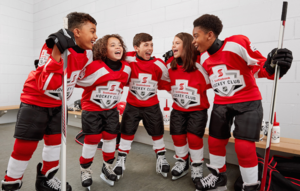 To	extend	their	support	of	kids’	community	hockey,	Scotiabank	is	contributing	up	to	an	additional	$50,000	in	sponsorship	to	the	first	500	qualifying	teams	that	register on	ScotiabankHockeyClub.FlipGive.com. Teams	can	apply	for	a	$100	Matching	Grant	to	help	them	get	their	season	off	to	a	great	start. The	average	cost	for	a	child	to	participate	in	hockey	is	$1,455,	not	including	specialized	workshops	or	team	travel. In	a	survey	conducted	by	FlipGive,	47 per	cent of	parents	spend	10-25 per	cent of	their	monthly	budget	on	their	child’s	athletics,	and	80 per	cent said	they	are	stressed	out	about	the	cost	of	their	child’s	sports. “By	working	with	FlipGive,	organizations benefit	from	a	cloud-based	solution	that	provides	best-in-class	fundraising	tools	to	their	communities,” says Mark	Bachman,	CEO	at	FlipGive. Registered	teams	are	provided	with	a	team	page	that	connects	them	to	over	500	retailers,	and	every	purchase	made	through	the	site	generates	cash	back	for	the	team. Since	its	launch	in	2014,	FlipGive	has	already	helped	raise	over	$10	million	for	groups	and	teams. To	sign up	or	learn	more	about	the	Scotiabank	Hockey	Club	Fundraising	Tool	powered	by	FlipGive,	visit	ScotiabankHockeyClub.FlipGive.com. FlipGive	is	a	cash back	site	for	youth	sports	teams	that	combines	the	convenience	of	online	shopping	with	the	best	of	online	fundraising,	making	it	easier	for	groups	to	raise	money. Teams	using	FlipGive	earn	up	to	25%	cash	back	for	their	sports	team,	league	for	school	simply by	shopping	with	national	retail	partners. It’s	a	fast,	easy	and	free	way	to	support	participation	in	sports.